With the holiday season approaching rapidly, I am always looking for fun finger foods/appetizers to give to my guests at our parties. 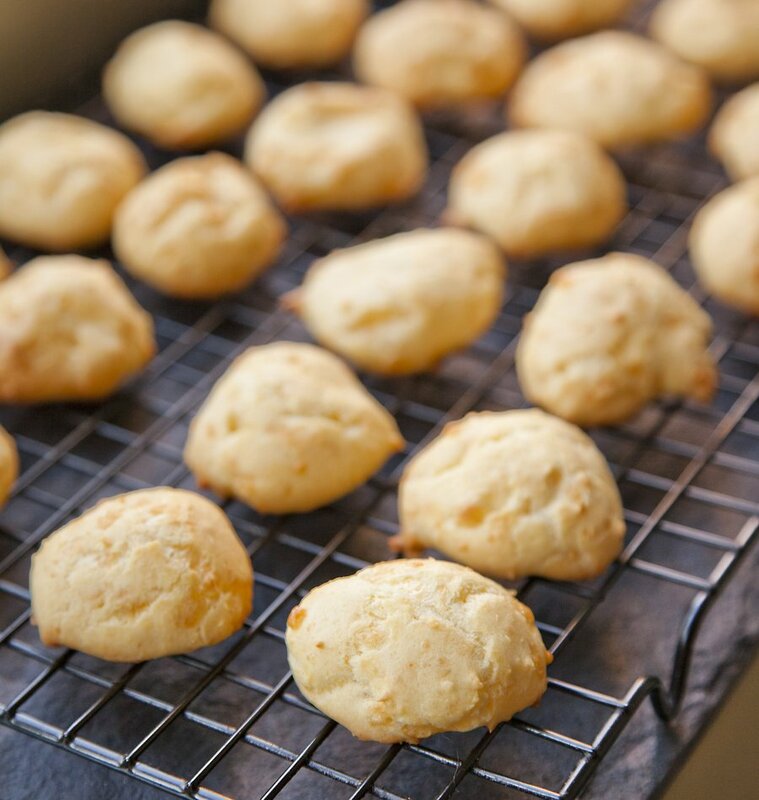 These Gruyere Gougeres are fantastic for a party – they’re light, tasty, vegetarian, and who doesn’t love a Cheese Puff? 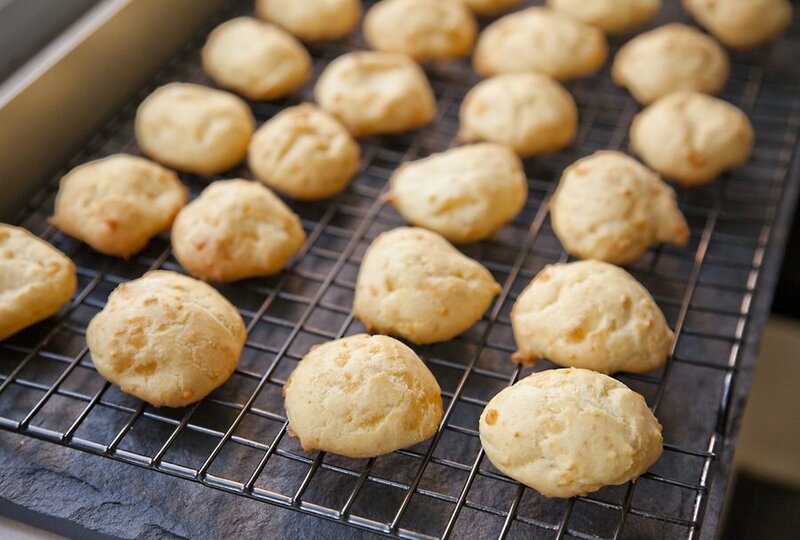 The great thing about this recipe is you can make these in advanced, freeze them, and then heat them up in less than 15 minutes to serve at your party! This recipe makes a huge batch, so it’s great for this! The perfect Cheese Puff - a great appetizer for your next party! Preheat your oven to 425 degrees. Line a baking sheet with parchment paper. In a heavy saucepan over medium heat, bring the milk, water, butter and salt to a rolling boil. Add the flour all at once, stirring quickly with a wooden spoon until the dough starts to come together and pulls away from the sides of the pot (this should take about 30 seconds). Remove the pot from the heat and let sit 5 minutes. Using a spatula, spoon the dough out of the pot into the bowl of an electric mixer fitted with a paddle attachment. Start to beat the dough on a medium speed, adding the eggs one at a time. After adding the eggs, turn the mixer up to high and add in the cheese, mustard, and cayenne. Mix for 3 minutes. 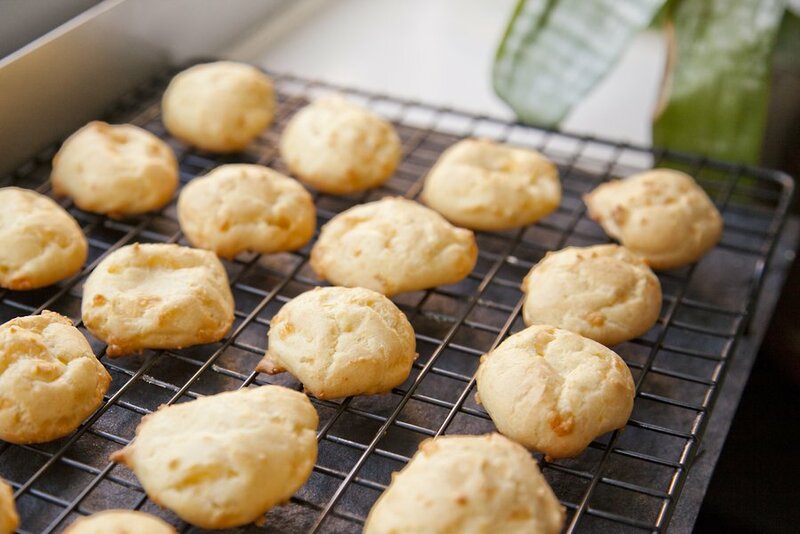 Using a measuring spoon , scoop the dough in 1 teaspoon increments about 2 inches apart on the parchment lined baking sheet (you will need to do multiple batches of this). Place the baking sheet in the oven and cook for about 8 minutes. Turn the oven down to 375 degrees and cook another 8-10 minutes until the tops turn golden brown. 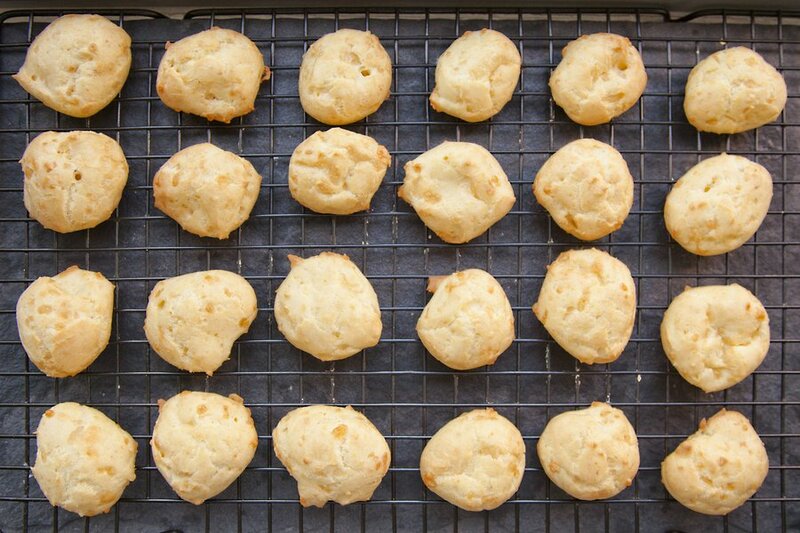 Remove the baking sheet from the oven and serve immediately. 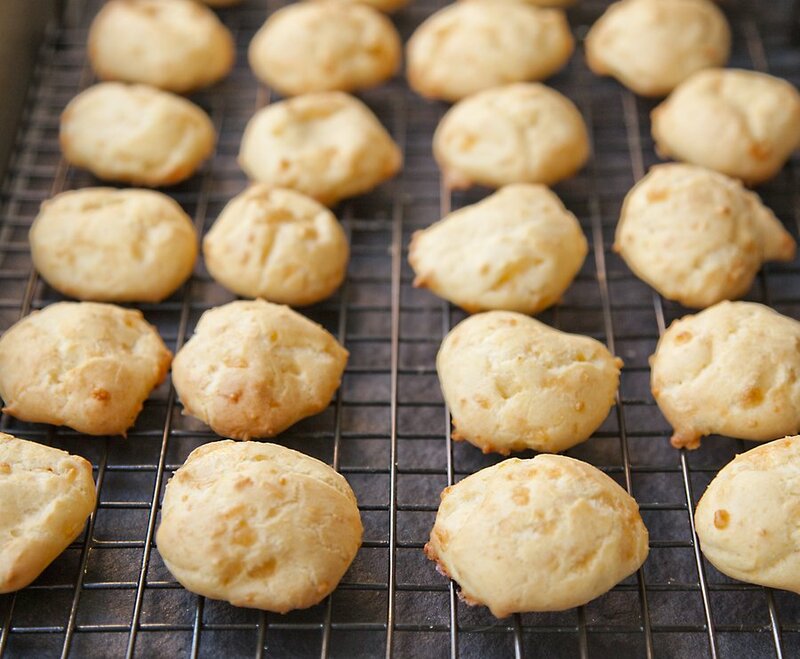 You can also cool the gougeres and freeze them for later use! 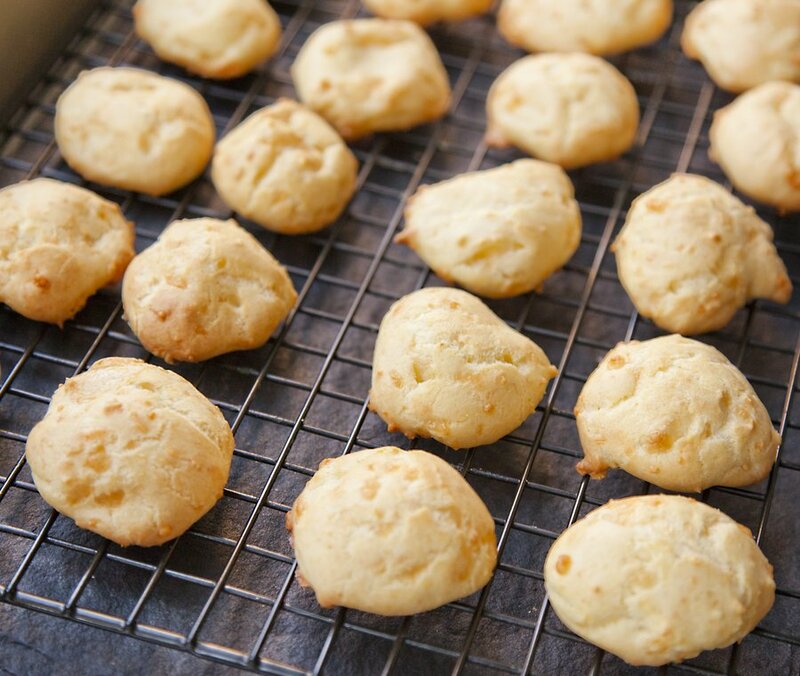 To reheat frozen gougeres, just pop them into a 350 degree oven, covered for 10 to 15 minutes.